Christmas time is coming and Rome is preparing to welcome the Holidays with lights, decorations and events. 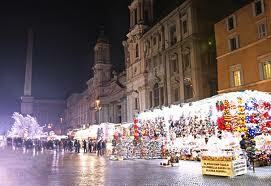 Like every year, the markets of the Roman tradition will be the most important attraction of the Holidays. In particular the Christmas market of Piazza Navona will delight adults and children during the month of December, until after Epiphany. The numerous stands that will be among the ancient buildings and the wonderful Bernini’s fountain, the lights and the parfumes will give a unique athmosphere to the famous square. But also in other places you will find traditional events, such as concerts and exhibitions of cribs in via dei Coronari, in via dell’Orso and in Sant’Eustachio area. Walking in the city centre you could also meet minstrels and fictional characters. Even Piazza Re di Roma has been honoring this tradition for some years with stands full of sweets, decorations and crafts, in a setting reminiscent of the Advent markets of northen Europe (in fact this square is twinned with the ones of Heidelberg. The conditions are excellent for nice walks in the heart of the Eternal City, at the sound of pipers and the possibility to warm holding in your hands a bag of roasted chestnuts, drinking a cup of hot chocolate or a glass of mulled wine. Its this time of the year, where we all enjoy this seasonal celebration all around the world even in Rome, and its cool that they have Christmas market! I’d like to drop by on Rome this time december, thanks for the post!